The Global Volcanism Program has no activity reports for Utila Island. The Global Volcanism Program has no Weekly Reports available for Utila Island. The Global Volcanism Program has no Bulletin Reports available for Utila Island. The island of Utila in the Carribean Sea off the northern coast of Honduras is the easternmost and lowest of the Bay Islands at the southern edge of the submarine Bartlett Trough. Utila is capped by a thin veneer of Holocene basaltic rocks at its eastern end (McBirney and Bass, 1969). Basaltic lavas and tuffs were erupted onto a coral-capped erosional surface. Stuert Hill (also spelled Stuart Hill) is a pyroclastic cone that was constructed at the center of the volcanic terrain, and Pumpkin Hill is a small littoral cone located along the NE coast of the island. The high point of the island is Pumpkin Hill, which rises only 74 m above sea level. McBirney A R, Bass M N, 1969. Geology of Bay Islands, Gulf of Honduras. Amer Assoc Petrol Geol Mem, 11: 229-243. The Global Volcanism Program is not aware of any Holocene eruptions from Utila Island. If this volcano has had large eruptions (VEI >= 4) prior to 10,000 years ago, information might be found on the Utila Island page in the LaMEVE (Large Magnitude Explosive Volcanic Eruptions) database, a part of the Volcano Global Risk Identification and Analysis Project (VOGRIPA). There is no Deformation History data available for Utila Island. There is no Emissions History data available for Utila Island. 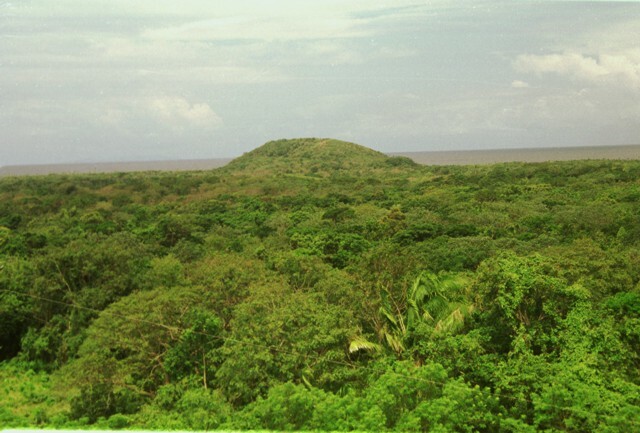 Pumpkin Hill, a small pyroclastic cone at the NE end of Utila Island, is seen here across a forest from Stuert Hill, the other pyroclastic cone on the eastern side of the island. The two cones lie about 2 km apart and were constructed over flat-lying terraces that cover much of the elongated, 3 x 11 km wide island. Alkaline olivine-basaltic lava flows erupted from the cones cover much of the eastern side of the island and underlie the forest in this photo. The Caribbean Sea lies in the background to the NE. The low peak in the background is Stuert Hill, a pyroclastic cone that rises only 51 m above the Caribbean Sea at the eastern end of Utila Island. The cone is seen here from across East Harbor at the SE end of the island. The cone forms an arcuate ridge composed of ejected basaltic tuffs and abundant blocks that include coral fragments, limestone, and metamorphic rocks. 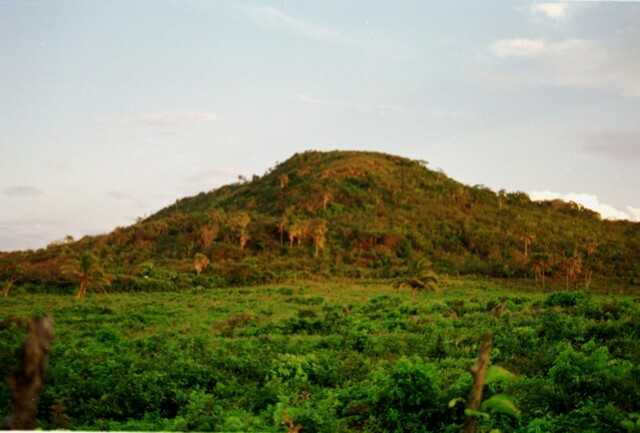 Pumpkin Hill, a low pyroclastic cone reaching only 74 m above sea level, is the high point of Utila Island. The cone occupies the NE tip of the island and consists of stratified basaltic lapilli and tuffs containing abundant blocks and small fragments of coral. The vent of the cone appears to lie on this side near its northern base, but only the southern half of the cone remains. 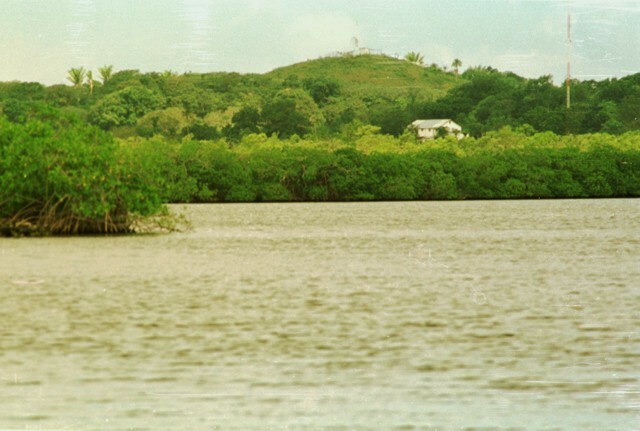 The low pyroclastic cone Stuert Hill (also spelled Stuart Hill) rises beyond Utila, the largest village on the island of the same name. 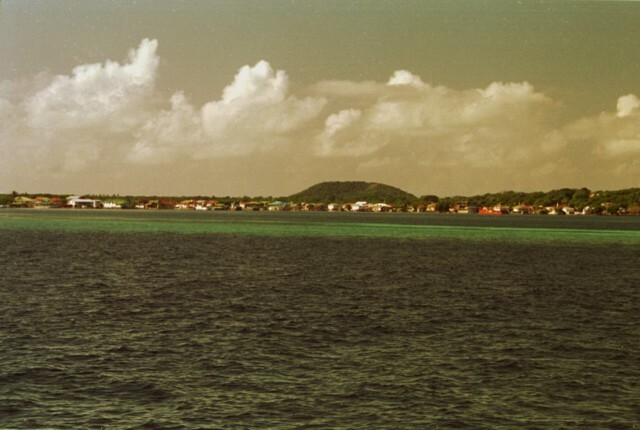 A ferry connects the village of Utila, formerly known as East Harbor, to the mainland of Honduras. Most of the island consists of flat-lying uplifted coral reefs; volcanic rocks are found only at the eastern end of the island. 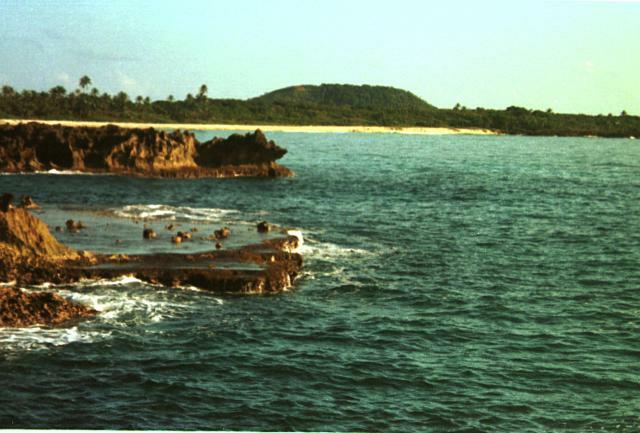 The low peak in the distance is Pumpkin Hill, a pyroclastic cone at the NE end of Utila Island. The small 74-m-high cone was erupted onto a coral-capped erosional surface forming the cliffs in the foreground and marks the high point on the island. Basaltic lavas and tuffs blanket terraces on the NE side of Utila. The island lies in the Caribbean Sea off the northern coast of Honduras and is the easternmost and lowest of the Bay Islands at the southern edge of the submarine Bartlett Trough. There are no samples for Utila Island in the Smithsonian's NMNH Department of Mineral Sciences Rock and Ore collection. Large Eruptions of Utila Island Information about large Quaternary eruptions (VEI >= 4) is cataloged in the Large Magnitude Explosive Volcanic Eruptions (LaMEVE) database of the Volcano Global Risk Identification and Analysis Project (VOGRIPA).